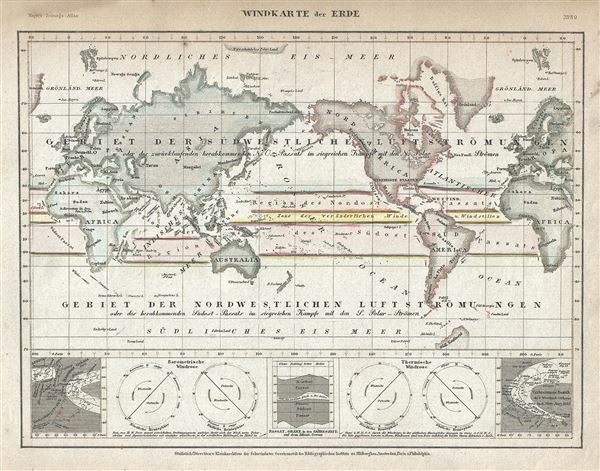 This is a charming 1852 map or chart or map of the World showing the trade winds by Joseph Meyer. Five inset maps are included along the lower border of the map and include diagrams of the barometric wind rose, a thermal wind rose and other specialized wind data. This map was issued as plate no. 89 in Meyer's Zeitung Atlas. Although all the maps in this atlas are not individually dated, the title page and maps were often updated while the imprint with the date was not, causing confusion to the exact date for some of the maps. Moreover some maps in the atlas were taped in at a later date as an update to the atlas. We have dated the maps in this collection to the best of our ability. Joseph Meyer (May 9, 1796 - June 27, 1856) was a German industrialist and publisher, most notably for the encyclopedia Meyers Conversation-Lexicon. Born in Gotha, Germany, Meyer was educated as a merchant in Frankfurt am Main. He moved to London in 1816, but returned to Germany in a820 after his stock speculations and business adventures fell through. Once back in Germany, he began by investing in the textile trade (1820-24). Meyer began creating business plans concerning how to start railways soon after the first steam-hauled railway began operation in December 1835. He founded the Deutsche Eisenbahnschienen-Compangie auf Actien (German Railway Rail joint stock company) in 1845. Meyer also found great success as a publisher, utilizing the system of serial subscriptions to publications, a new idea for the time. He founded a company, Bibliographisches Institut in Gotha in 1825, which published several versions of the Bible, works of classical literature, atlases, the world in pictures on steel engravings, and an encyclopedia. Meyer, J., Meyer's Zeitung Atlas, 1852. Meyer's Zeitung Atlas, formally titled Neuster Zeitungs-Atlas Fuer Alte und Neue Erdkunde was a popular German hand-atlas published in Heidelberg by Joseph Meyer between, roughly, 1848 and 1859. The atlas is well engraved in the German style with exceptionally dense detail and minimal decoration. Meyer's Atlas, and its constituent maps, are typically very difficult to date as later editions often contain earlier maps and earlier editions later paste-in updates. That said, the atlas' frequent updates and publication run during a turbulent decade provide a noteworthy cartographic record of the period. Very good. Minor spotting at places. Overall age toning. Blank on verso.